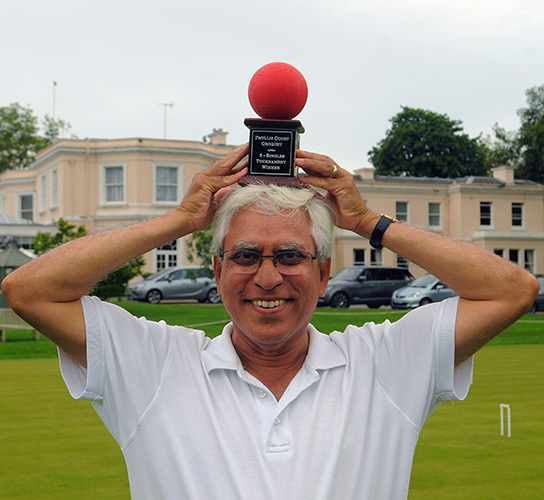 Raghu Iyer played superbly today in winning the 'Red Ball' trophy ahead of a small but very competitive field. Richard Peperell was the favourite, now sporting his newly reduced handicap of 2, but he started with two narrow 7-6 scares, as the rest of the filed lined up as potential banana-skins. It was Don Rutherford who undid Peperell’s day, with a surprise win in the third round, and little did we know it at the time, but this was a crucial score. Meanwhile, further down the seeds, Raghu Iyer was busy chalking up win after win and was clearly the 'form guy'. The meeting of Peperell and Iyer was delayed until the last round, in an effort to have something 'hanging' on it, but some pre-game maths by both parties revealed that Peperell needed an impossible 9-0 win to overturn Iyer's advantage. Their last round match was a fitting finale, which Peperell did win but only by 7-6, giving Iyer the trophy on 'net hoops'. Delia Norris picked up a bottle of wine for the most index points gained (excluding the winner). Chris Roberts was 'on song' this weekend at Cheltenham where he hit everything to win their top ranked Open Championship. The win gives him a converted automatic entry into the end of season English National Singles Championship (for the 'Ascot Cup'). Peter Haydon and Roger Goldring also took part in this event, the former making the cut to the main event, but the latter missing out - both went on to record satisfactory results thereafter. At the heart of he main event, Roberts dropped only one game on his way to a final showdown with Ascot Cup holder Ian Burridge, who also holds a 'scary' -4 handicap. In truth Burridge was not at his best but Roberts high percentage clearances earned him a 7-4, 7-4 victory and the most prestigious title of his career. Helena Fensome and Charlie von Schmeider played for Oxfordshire today in a four team qualification event for the (GC) Inter-Counties Championship in September. Two places were up for grabs, at Surbiton today, but Surrey and newcomers Northamptonshire were successful at the expense of Oxon. and Bucks. 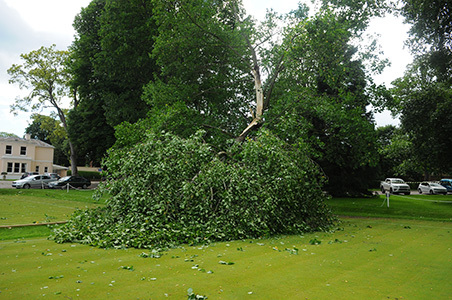 A large section of the tulip tree that over-hang the corners of courts 2 and 3 came down in this afternoon's heavy rain and winds. It was most fortunate that the lousy day meant that nobody was playing croquet today. 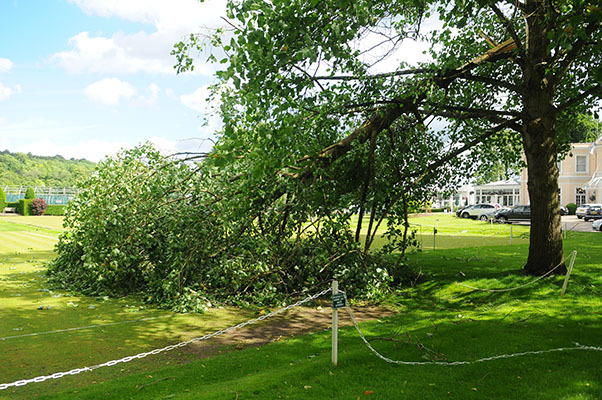 It is a blessing for us in the Croquet Club to be frank, because the shade and 'droppings' from that tree had made a mess of the GC start corner of court 3 for the past few years. Now at last that area can see some light and our head gardener Paul and his team can get some grass growing there again. The tree has been reduced to a stump only and all else has been tidily removed. Phyllis Court 'B' beat Harwell 7-5 to chalk up a second win in the SCF handicap league today. Although down 1-2 after the two rounds of doubles, the 'B' rallied to win six of the eight singles rubbers with captain Raymond Wood and Mike Fensome both victorious twice. Our AC handicap team had some close games but only won 1 from 8 in today's friendly with Hurlingham. Raghu Iyer saved our blushes with victory in the last game to finish and the unfortunate Peter Haydon lots both his game by a single point! Chris Roberts and TJ Johanson found the visitors playing too well with their bisques. There was no holding PCC 'C' today who the dropped only one game to thrash visitors Dogmersfield 11-1 on a scorchingley hot day. Chris Roberts, Roger Goldring, Helena Fensome and Peter Haydon have all found it tough going at this season's British Open at Surbiton. Day One closed with all four registering only two wins apiece and so looking unlikely to qualify for half field 'cut' and the end of the second day. There was not much to write home about on day two either. Roberts improved to register four more wins and only missed the 'cut' by one victory, but further success proved illusive despite our players being competitive throughout. That was until the last game of the day when Goldring pulled off a real surprise by beating USA based Egyptian Mohmmed Kamal, which was a real 'scalping'. Peter Haydon has now withdrawn but the other three will continue in the plate event for the next two days. Frances Colman attended for two day to do some refereeing and will be back on Sunday after playing representing Phyllis Court in the SCF AC Armada Doubles tomorrow with Robin Coates. 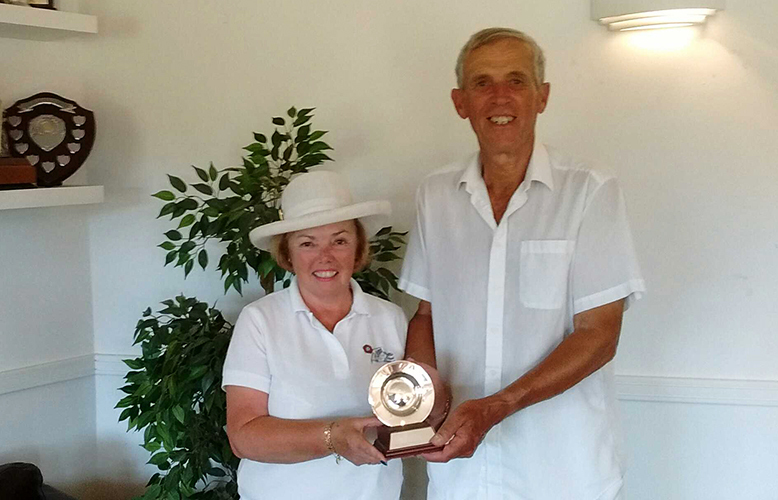 Great news today - Phyllis Court representatives Frances Colman and Robin Coates won the SCF AC Handicap 'Armada' tournament! The pair were undefeated and delighted, especially as Robin is such a novice at the AC game - so much so that he had only played one full game of AC before. The experienced hand of Colman guided the new man throughout but he played his part too with some deft strokes. The win at Hamptworth today, sees that Armada trophy return to Phyllis Court for the first time since 2014. PCC 'A' struggeld to see off a game Littleton team today, despite appearing to be much sronger on paper. Perhaps it was the heat, or three of our team lacking the necessary engagement after four days at the British Open, but credit to the visitors who played above themselves. The forst round (best of threes) went well enough in he morning with only one game dropped but all maatches won (3-0 to Phyllis Court). The afternoon singles were another matter though and Littleton took a game in each and, in the case of the 1 v 1 match, Chris Roberts actually lost it. So, although the 6 - 1 scorline looks comfortable enough, it was far from so. The first PCC Crqouet themed quiz night was great fun this evening, with good food and good company. A mixture of easy and hard mainly general knowledge questions, but with croquet themed answers, prepared by quiz masters Frances Colman and Chris Roberts, kept everyone engaged. There was event two picture rounds that featured famous faces from George Cloony to Betty Boop playing croquet (and nobody got Leon Trotsky!). It was such a good night we will probably have to do it again next year. Three of the PCC quartet (Chris Roberts, Roger Goldring and Helena Fensome) played in the consolation plate event for places 16 to 32 at the British Open for the last two days, having failed to make 'the cut' for the main event knock-out. Roberts made the final of that but sucummed to Ipswich's Martin French. It is with sadness that I have to inform you that our member Phillip Allison passed away on Sunday at the Sue Ryder Home, Nettlebed. 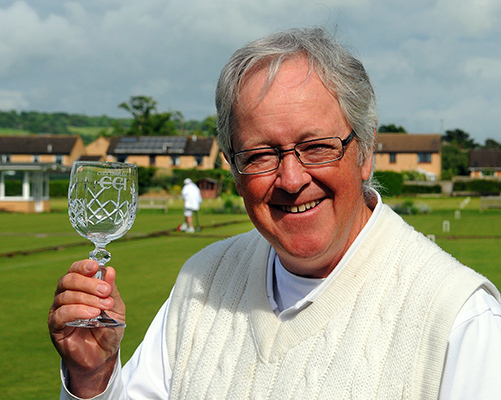 Philip was a well liked and valued gentlemanly player within our Club, where he as a very good supporter of our teams, tournaments and social play – he will be much missed by us all. He was one of the best supporters of the new competitions and tournaments that we introduced in the past few seasons since he took up the sport, and for that I am particularly grateful. One could always rely on Philip to participate if he possibly could. Phyllis Court C team at Blewbury and Harwell. 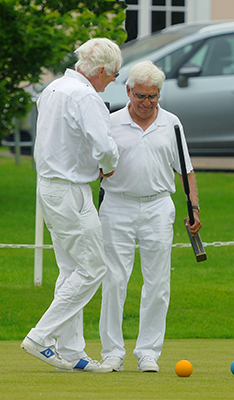 on the (prize) 'Hugh's Mallet' which on permanent display in the croquet pavilion (as remembered in this picture). string of more experienced players along the way. Philip’s funeral service is to be held at 2 pm. on Thursday, 6 July at Reading Crematorium at 2.00 pm. rather than black attire. No flowers please but donations if desired to Sue Ryder Hospice. Mike Fensome's recent good handicap play form for PCC 'B' and then thrashing Chris Roberts in our Handicap Singles competition saw him earn a handicap reduction back to the 1 grade. And Robin Coates is another who has been in sparkling form in the competitions (his best was beating Hugh Crook (5) playing level) this week, and as a new player this season for PCC 'C'. He has earned a second reduction in as many months - he's gone from 9 to 7! - congratulations both. Captain Raghu Iyer reports - "I am afraid we (PCC C) failed to win today against High Wycombe in the SCF GC Handicap League today, but we did manage to secure a creditable 6-6 draw against a team of three 2s and an 8 handicap. After the four doubles the score was 2-2; all of us on both sides the proceeded to win one and lose one to give a 6-6 result. But we still lead the table! " PCC 'C': Dianne Browne (6), Raghu Iyer (6), Robin Coates (7), Ralph Chambers (7). The shaky start to the season that saw Phyllis Court 'B' lose their first two games, now seems to be well forgotten as Raymond Wood's team scored a third victory on the bounce today, beating Basingstoke 8-4. Top dog this week was Hugh Crook who won both his doubles games and then both his singles too, while number 1 player Mike Fensome was also impressive in beating with the higher ranked Basingstoke captain. There were a number of close games, as one would expect with handicap play, but the tight games are now going Phyllis Court's way, unlike earlier in the season, when the reverse was certainly true. PCC 'B': Mike Fensome (2), Raymond Wood (3), Hugh Crook (5), Colin Morgan (5). PCC 'A' were comforatble winners 6 - 1 at Harwell today. We were please to be able to give a run-out to the experienced Carol Jackson and David Hopkins, newly arrived from South Africa for there usual summer in Henley. with respect to Harwell, it should have been an easy match but their number one player Ivo Ponting (4) got himseld an impressive 'scalp' when he unexpectedly beat Hopkins (2) 2-0. That aside all other games went our way so it's two wins from two, but with the traditionally tougher opposition now to come. PCC 'A': David Hopkins (0), Carol Jackson (0), Roger Goldring (1), Helena Fensome (1). Blewbury fielded a stronger team on paper aginst our AC A-level league team this evening. England International Robin Brown (-1.5) beat our own South African International Carole Jackson (0) +16. But Chris Roberts (1) scored another good win over Nick Butler (-0.5) (for the third time in a row) this time by +10.